Concrete block making technology has come a long way from its invention by the ancient Romans. Concrete blocks were initially made manually where each mason would make blocks through special molds designed with the required dimensions. With the slow pace and enormous energy demand for these blocks, there was need for faster manufacturing which led to development of the concrete block making machines. The basic technology of the concrete block machine involves molding the concrete and allowing them to set, and cure to form a concrete block. The production process is therefore in a sequence of 4 processes which are mixing, molding, curing and cubing. The shape and design of the concrete block has a great effect on the manufacturing process of these blocks. In development of new block design careful consideration must be made to retain the cost of production to a minimum. Complex molding directly translatesto increased production costs. The block making machines are highly efficient in operation and precision to ensure cost of production remains at optimum level. The current machines arefittedwith accurate instruments and timers for profitable operations. Machinery capacity, this is the output of the machine per hour. Thisoutput varies depending on the machine size and model with some equipment going up to 40 blocks per cycle. The power consumption efficiency of the machine. Advancement in machine technology has led to addition of other features such as vibration motors able to deliver a 0.5 hp, and up to 3000 vibrations per minute. More advanced models are equipped with a travel motor for easier placement of molded blocks. Block making machine is made to be user friendly and easy to operate, this is important for easy training of users on site. The durability is guaranteed through usage of strong steel frame work able to resist the heavy workload on the equipment. Innovations in the concrete block manufacturing process has led to development of machines that have the ability to manufacture hollow blocks of equal strength characteristics as the solid blocks. This translates to material efficiency and huge savings to the total cost of materials. There has been rapid advancement in the concrete block making technology. 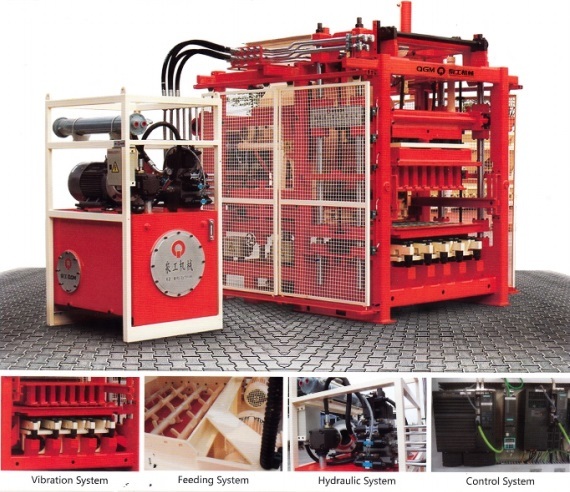 Block making machines are able to deliver high quality concrete blocks over a short period. The machines are developed to withstand the heavy concrete workload without damage to the equipment. The concrete machines come in various models, and sizes vary depending on the desired throughput.